And two of the three balls of Heirloom Baby Wool - I've changed the colours, the original wool is pale green... very happy with how these have turned out. 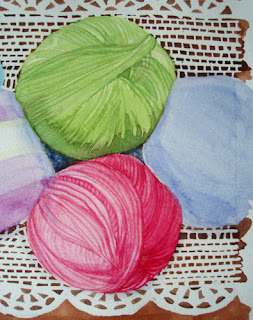 The two other balls of yarn have just got washes done, as preliminary layers - they're next for the brush! I'm about 3/4 done, I think ... another day will see this painting finished. It looks just beautiful, can't wait to see it all finished!! love the colors. 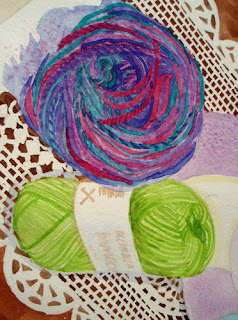 your detail in getting the strand of a yarn is great. Will we be drinking something with these? You've been a busy girl! I love the colours - so bright and cheery. oooh! Look at that!!! Looking good! You just keep getting better and better. I am in awe! I saw these quickly in Reader view and thought the top one was a photograph. What detail! Beautiful!! Have I mentioned lately that I think you're amazing? Oooooo!! Pretty! You totally rock! Oh Ksee is right - what would be an appropriate drink? Homemade lemonade? It looks so beautiful Jejune! Just gorgeous! I love all the skeins of yarn like that on the runner. It will make a great mug. I'm really glad you got a Jejeune Day. It's important. Absolutely beautiful, once again! I've just managed to get a copy of the latest VK so congrats. once more. And here's to many more Jejune Days! Awesome! So lifelike - like a photograph, only better! What fabulous talent you have. These are beautiful paintings. Crossword Bag Pattern & Clever Friends!